The Maine Hindu Temple on the Scarborough-Buxton town line, the first of its kind in the state, provides a spiritual and cultural anchor. SCARBOROUGH — As soon as she saw it, Tejinder Jit knew the old white church was the perfect place for a Hindu temple. 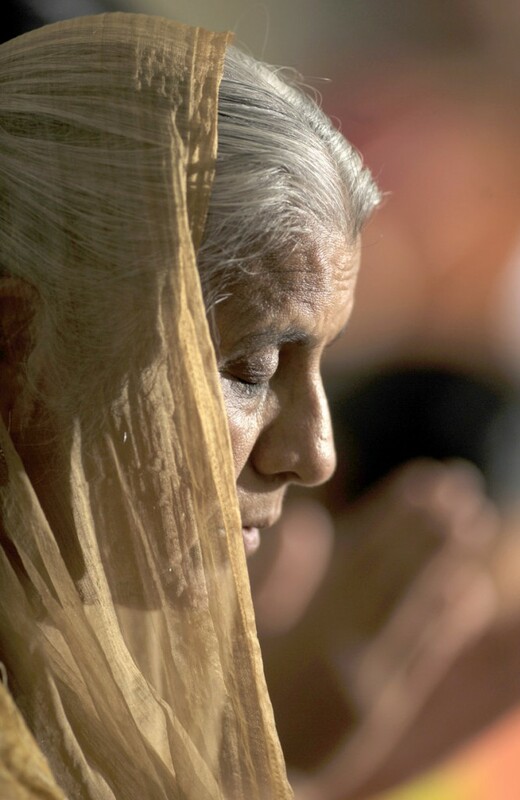 Kamlesh Kaur of South Portland worships at the new Hindu temple on the Scarborough-Buxton town line Thursday. Worshippers pray at the new Hindu temple on the Scarborough-Buxton town line Thursday. The group is still renovating the building and the temple will officially open in the fall. Sandeep Gandra, at left, will serve on the board of directors. 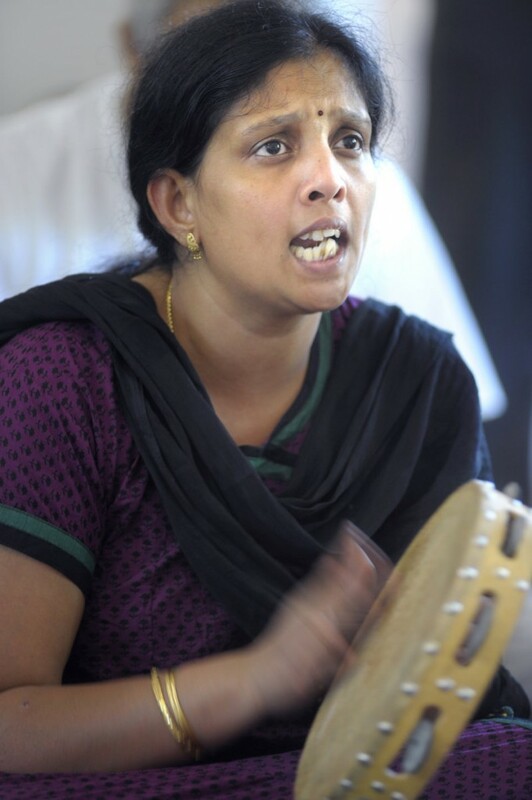 Sreevally Challapalli of Scarborough sings at the new Maine Hindu Temple. That old white church, at County and Broadturn roads, straddles the Scarborough-Buxton town line, surrounded by woods. It’s everything one would expect in a traditional New England meetinghouse: tall windows, crown moldings, straight-backed pews. But the wooden pulpit and the first few rows of pews are gone, replaced with colorful images of Hindu deities, burning incense and fresh flowers. It is a rebirth of sorts for the church, and a labor of love for a community that has longed for years to have a place in Maine to call home. The former First Universalist Church of Scarborough and South Buxton is now the Maine Hindu Temple, the first community temple in Maine. Jit, who owns the Tandoor Indian Restaurant in Portland, bought the building last month and members of the Hindu community went right to work cleaning and repairing the church and fellowship hall. They have removed cobwebs, planted flowers and painted their sacred om symbol on the front of the building. The church, originally known as the Proprietors Meeting House, was built in 1839 at what was known as Coolbroth Corner. Residents traveled as far as six miles by horse and on foot to attend meetings and worship services. The Universalist Parish of Scarborough and South Buxton was organized in September 1891 and, by the late 1800s, a Sunday school was established at the church. The hall next to the church was built in 1914 to provide space for meetings and suppers. The First Universalist Church of Scarborough and South Buxton was incorporated on March 16, 1914, giving the church the name by which it was known for generations. Fred E. Moulton addressed the Friends of the Universalist Church of Scarborough and South Buxton in 1939, on the 100th anniversary of the meetinghouse. “We love every nook and corner of this old church, one of the most beautiful places on God’s earth,” he said in his address. 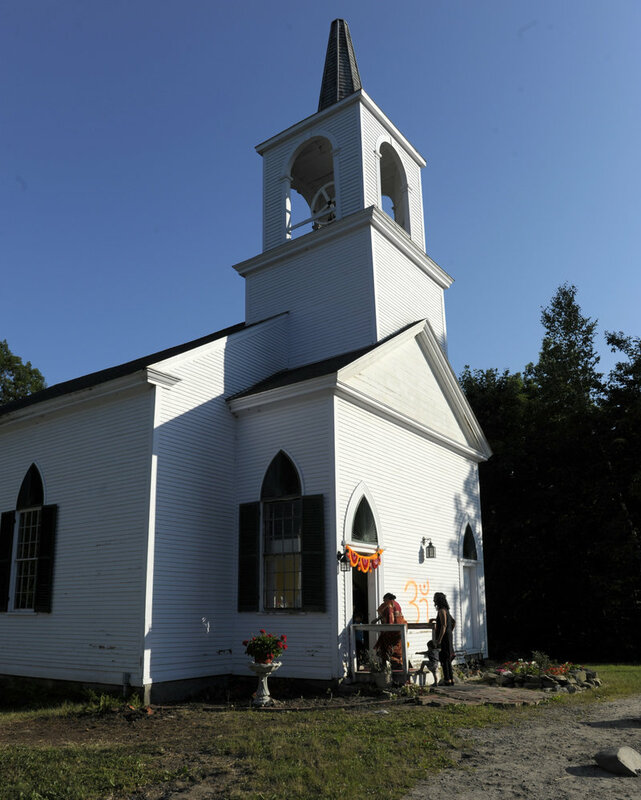 The building was cared for by the Friends of the Meeting House before the Anchor Missionary Fellowship of Gorham began meeting in the fellowship hall in 2002. The fellowship sold the church and hall to Jit last month for $155,000. The temple will reimburse Jit, and has so far raised $30,000 in donations from members. While the Anchor Missionary Fellowship did some restoration of the buildings, members of the temple say much remains to be done. They are getting prices to paint the building and replace the roof. Jit said the exterior will remain the same, but several pews were removed to allow more space for prayer. Those pews were given to a man who was baptized in the church and a neighbor whose family has a long connection to the building. The rest will be saved, possibly to be given to the local historical society, according to members. The temple won’t open officially until fall, but members have been gathering there in prayer for the past couple of weeks. Last Thursday night, about 15 gathered for a community kirtan, which consists of songs of praise and devotional singing with instruments. As the sun streaming through the windows slowly dimmed, Aparna Rampalli and Sreevally Challapalli, both of Scarborough, handed out folders of prayers and sat on a carpet to pray. At the front of the room, a large image of the Lord Ganesha dominated the altar, surrounded by food offerings, flickering lamps and smaller pictures of deities. For more than an hour, the worshippers sang prayers in Tamil and Telugu, accompanied by the soft tinkling of bells and hand cymbals. Standing outside as the sound of the prayers and the scent of incense drifted out the front doors, Deven Bhatt and Sandeep Gandra reflected on opening a Hindu temple in Maine. The search for a location for the temple began last year, spurred by Hindus who wanted a place to gather outside of their homes without driving two hours to a temple in Boston. The temple will eventually include a cultural center for dance and language lessons. Mamta Punjabi, president of the India Association of Maine, said the state’s Hindu community has been growing since she moved here in 1996. There are no official population counts, but members estimate there are close to 400 Hindus of Indian origin in Maine, primarily in Portland, South Portland and Scarborough. Last fall, the Devali festival — the festival of lights to mark the end of one year and the start of a new one — drew about 450 people, Punjabi said. More than 2 million Hindus of Indian origin live in the United States, according to the Hindu American Foundation. Of the 1 billion Hindus worldwide, 93 percent live in India. Punjabi, who owns an Indian grocery store in South Portland, said many who move to Maine from areas of the country with larger concentrations of Indians experience a kind of culture shock because of the lack of a temple and cultural activities. Punjabi has already heard good things about the temple from a friend who came from Augusta to visit. “He said, ‘You walk in there and it has so much soul to it,’ ” she said. 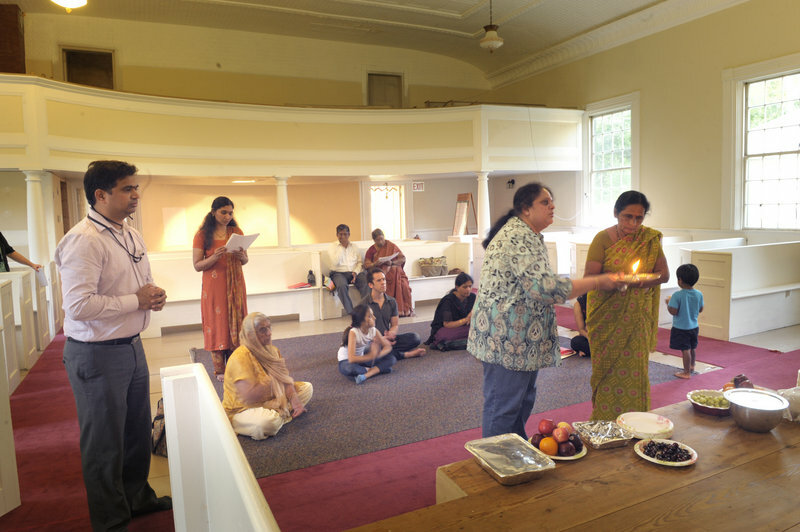 Bhatt, who was at the recent kirtan, sees the opening of the temple as an opportunity for the Hindu community and a way to continue the 173-year tradition of the building. After prayers were over Thursday, Manjula Yeety of Scarborough smiled broadly as she looked around the temple. Like the others who gathered for the kirtan, she had trouble expressing the significance of finally having a temple. After a moment, she found the words. “It is a dream come true for every Indian family in Maine,” she said.